Mix together the marinade ingredients. Add the chicken and mix to combine. Thread the chicken onto bamboo skewers. Set aside to marinate for 10 minutes to overnight. To make the cucumber relish, heat the sugar, vinegar and salt in a saucepan over high heat for 3-4 minutes or until the sugar has dissolved. Allow to cool. Then transfer to a bowl. Stir through the cucumber, shallots and chillies. For the satay sauce, use a mortar and pestle or food processor to grind roasted peanuts to a fine powder. Set aside. Heat the 2 tablespoons of vegetable oil in a saucepan over medium heat. Add the curry paste and cook for a minute until fragrant. Add the coconut milk, peanut butter, fish sauce and sugar. Then stir through the roasted peanut powder. Cook for a further minute. Then remove from heat. And keep warm or reheat when ready to serve. Heat a barbecue grill plate or non-stick frying pan over medium-high heat. 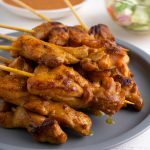 Cook chicken skewers for 3-4 minutes each side or until cooked through. Serve warm with the warm satay sauce and the Thai cucumber relish.